﻿Stacey is my one and only best friend. Maybe if I was taller or wider or louder or prettier I would need more than one so I could spread myself around more. Like Brooke Morgan. She’s the prettiest girl in my fourth grade class at Purdee Elementary. She’s also tall. And kind of loud. It takes a lot of friends to soak her up. We’re happy with just one best friend each. But it’s the middle of the fourth grade, and things are changing. Brooke has dropped her former best friend Jenna and seems to have decided to make Stacey her new BF. And Stacey seems to like it that way. She hangs out with Ida when she’s not doing dance stuff with Brooke, still sharing a giant cookie at the Purdee Good Café after dance lessons, but the other times when the two have usually spent time with each other seem to have been lost to Brooke’s constant demands. Then, when Jenna’s Truth or Dare game becomes the girls’ favorite recess activity, Ida is dared to shout “There’s a mouse in my macaroni and cheese,” in the cafeteria and gets sent to the principal along with Quinn, whom Randi accuses of planting the miscreant mouse in the macaroni. Ida feels compelled to tell the truth for Quinn’s sake and finds herself ostracized by the girls. Even Stacey, although sympathetic, seems to be avoiding her everywhere. Strangely, Jenna seems to be the only one who wants to spend time with her, prickly Jenna who always seemed the bossy one in the group. Then Ida learns that her penance for “spilling the beans” to the principal is a triple-dog-dare, requiring that she let Meeka pierce her ears at Brooke’s sleepover. Ida’s parents have told her she absolutely cannot have her ears pierced until she is at least ten, and besides, Ida is really scared of Meeka’s big embroidery needles! How can she get out of this triple-dog-dare and still stay friends with the girls? I think about how much I like meeting Stacey and sharing a cookie and talking about best friend stuff. But sometimes plans change. Sometimes friendships do, too. Not in a bad way... Just in a different way. Maybe even a good way. Because even though I still like Stacey, I know I’m not exactly like her. 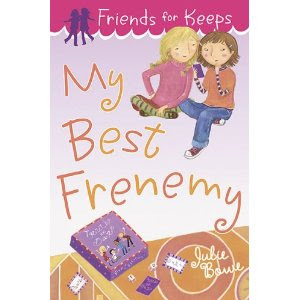 Fans of this insightful series will not want to miss My Best Frenemy (Friends for Keeps) and Bowe's forthcoming-in-July sequel, Friends for Keeps: My Forever Friends and will look forward eagerly to seeing how the changes within the girls’ relationships will work themselves out as the school year comes to a close.